Banten Province provides both natural and landmark attractions. 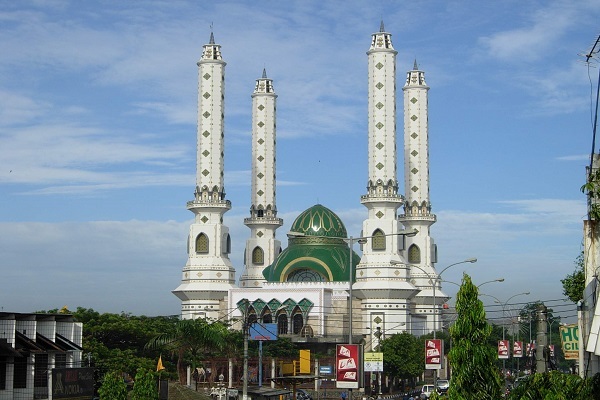 For those who are into religious tourism, there is Nurul Ikhlas Grand Mosque in Cilegon City. The locals use it for giving prayers indeed. However, it also becomes a tourist lure these days. Thanks to the beautiful design and sacred nuance. The mosque lies in Jombang Village and it is situated in front of the Cilegon’s Mayor Office. Here is a simple fact about it. The mosque has been there before the independence day of Indonesia. That means it is considered an old structure in Banten. The color of the grand mosque of Nurul Ikhlas is white. The dome has the blue/green color, though. The mosque features four towers and they share the same height. The width of the land is about 3600 m2. In terms of design, it applies the Dutch’s architecture. In the past, the towers weren’t quite tall. The government had conducted several renovations to this structure over time. Today, it has a flawless beauty. No wonder, many travelers often drop by in the mosque. It is a worthy place to visit, after all. The mosque has three levels. Each of them has a different width, actually. The first floor is the place to take Wudhu. You can also find several toilets. The second floor is the place to give a prayer. So, what is the third floor? It is a praying room, especially for women. At several occasions, the 3rd floor is used for an extra space for praying. It is usually during Eid Al-Fitr, Friday’s Prayer, or other important Islamic events. The main door is situated near to the gate. You can notice it easily. Nurul Ikhlas Grand Mosque doesn’t feature a spacious parking area. Due to this reason, it is a little bit difficult to park your vehicle. It becomes more difficult during the big Islamic days, in fact. Despite this issue, both the interior and exterior design of the mosque is quite pleasing. Once you get in the mosque, you can feel a calm nuance. The building also emits a modern beauty. Overall, you won’t get disappointed in visiting it. It is even possible to take some pictures either outside or inside the mosque. The most interesting thing about Nurul Ikhlas Grand Mosque is the design. No wonder, many people take some pictures of the mosque with their camera. As an alternative, you can rest inside the mosque. The thing is you are not allowed to disturb the prayers. Make sure to create a serene and comfortable nuance in the mosque. Otherwise, the locals won’t appreciate you. The worst case scenario is that they will ask you to leave. For those who come from Jakarta, a trip to Cilegon City takes 2 hours and 30 minutes. It can be longer, though. The distance is 117 km and you can take Pantura Street. Next, you only need to head to Jombang Village. The mosque is located near to Mayor’s Office, so you may notice it easily.